The is unusual cut of jacket falls into soft bias points in front and is squared-off in back. 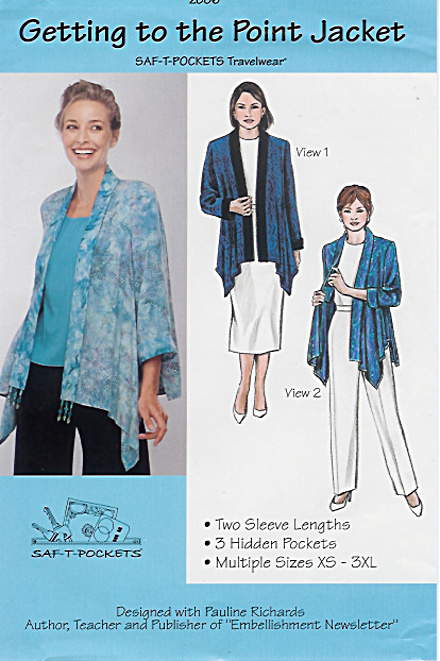 The set-in sleeves come in 3/4 or full-length. The jacket is accented with a front band and cuffs that can be made of matching or contrasting fabrics. Hidden inside the jacket is a hanging pocket attached to the armhole and the two pockets inside the front band are perfect for a credit card, money or a lipstick. This comfortable jacket is perfec for a black tie event or everyday wear.